Iranians shop in a bazaar in Tehran, Nov. 5. While seeking for new routes for trade with Iran, Turkish businesspeople and experts have said that the second wave of the unilateral sanctions imposed by the U.S. on Iran has disturbed foreign investors, stating that the decision disrupts the global system and makes it difficult to do business with Iran. Washington's decision to withdraw from the 2015 landmark nuclear deal between Tehran and world powers aimed at curbing its nuclear program and reinstating the sanctions that were lifted by the agreement, is a decision taken unilaterally, Foreign Economic Relations Board (DEİK) Turkey-Iran Business Council President Ümit Kiler said, adding that by the international law, other countries are obliged to comply with U.N. resolutions only. In May, U.S. President Donald Trump unilaterally withdrew his country from the nuclear deal signed between Iran and the P5+1 group of nations - the five permanent U.N. Security Council members, namely the U.S., Russia, China, Britain and France plus Germany. He also announced that he would reinstate sanctions against Tehran, which were lifted by the agreement in exchange for tight restrictions on the country's nuclear program. The measures that came into effect on Monday and restored all the sanctions that had been lifted under the accord. According to Kiler, the said sanctions negatively affect other countries as well. "The sanctions have made trade in dollars with Iran impossible. It is important that countries such as Germany, the U.K. and France, that have serious economic interest in Iran and that had previously negotiated and concluded the said agreement with Iran, and have recently expressed that they would not comply with the said decision, have expressed their will regarding the said issue. We hope to see the practical implications of this will in the coming period," he said. As a neighbor country of Turkey, Iran, has been one of the most important trade partners of Turkey for 40 years, Kiler said. He noted that the achievement of Turkey's medium and long-terms goals firstly depends on permanent peace and stability environment in its region. "Any kind of foreign intervention that could destabilize the region works against Turkey and its companies." "With the gradual introduction of sanctions by the U.S. administration, it has become more difficult to do business in Iran and trade with Iranian companies. Iran has been removed from the investment plans of Turkish companies in the short term," Kiler noted. Turkey has opposed the unilateral sanctions as Turkey is one of the key customers of Iranian oil and gas, benefiting from geographical proximity, crude quality and favorable price differentials. According to the annual market report of the Energy Market Regulatory Authority (EMRA), Turkey imported 9.2 billion cubic meters of gas from Iran last year, which accounted for 16.74 percent of the country's total gas imports. Turkey is also one of the key destinations for Iranian crude, accounting for more than a quarter of Turkey's daily average imports of around 830,000 barrels, according to data from the market regulator. While the country imported 930,978 tons of crude oil from Iran in May, the figure fell to 287,842 tons in June, according to the monthly petroleum industry report from the EMRA. In July and August, oil purchases from Iran totaled 867.3 million tons and 674.3 million tons, respectively. However, the trade volume between the two countries entered a downward trend and dropped to around $10.6 billion by the end of 2017. "Our exports to Iran in the first eight months of this year have decreased by 20 percent compared to the previous year. It can be understood that the U.S. administration has made trade with Iran more difficult with sanctions. On the other hand, as during each period of history, Turkey is destined to trade with Iran. Just as Turkey needs Iranian oil and natural gas, Iranian people also need industrial products and daily consumption goods imported from Turkey. This trade composition will not change," Kiler said. As part of the business world, he said, they expect Iran's problems with the world system to be resolved permanently through peaceful and diplomatic means. "We hope that Iran will again become a dignified and responsible member of the global system. While unilateral sanctions are disrupting the global trade system, they have also became distanced from serving the targeted political objectives," Kiler noted. Iran's oil revenues account for 50 percent of its public revenues, according to the Foundation for Political, Economic and Social Research (SETA) Energy Researcher Yunus Furuncu, who said that the U.S. sanctions are aiming at bringing the Iranian economy into a difficult situation. He noted that the sanctions especially imposed to prevent oil sales will adversely affect the already difficult situation of the Iranian economy. "Iran, which produced about 3 million barrels of oil per day in July this year, one month before the first sanction package was implemented, fell to 2 million last month. This decline represents an annual decline of $26 billion in exports. 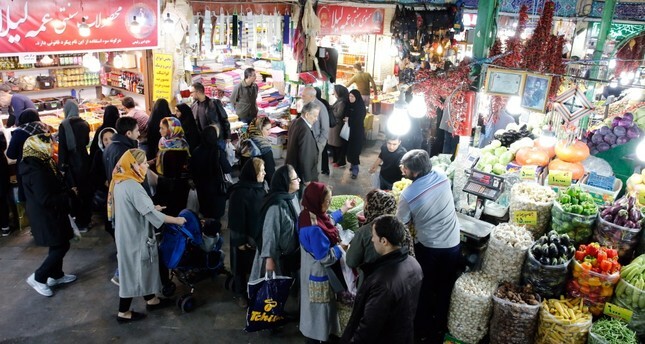 In an environment where the Iranian economy is having a hard time and protests are rising due to economic problems, the unrest in the country may increase," Furuncu explained. Furuncu further stressed that the countries that are importing oil from Iran, particularly some EU countries, China and India have opposed the sanctions, however, the situation is different when it comes to practice, and that the international companies have begun to suspend their trade with Iran. Global companies such as Mercedes-Benz, Mazda Motors, Siemens, General Electric, Lukoil and Boeing, all of which have trade relations with the U.S., have decided to leave the country, he said, adding that among the said companies, there are also very important French giants operating in automotive, aviation, and petroleum industries such as Peugeot, Citroen, Renault, Total and Airbus. The number of firms that consider engaging in trade with Iran may further decline due to concerns over U.S. sanctions, Furuncu said. "Turkey will act cautiously with regards to the sanctions. The U.S. has prevented the countries that are against sanctions to form a united front by issuing waivers for eight nations. If these waivers were not provided, U.S. ties with India and China would have been strained since these countries had previously announced that they would continue oil trade with Iran despite sanctions. With a six-month waiver package, the U.S. administration managed to contain the situation," he said on the U.S. decision to grant waivers. On Monday, the U.S. granted a waiver to Turkey and seven other countries, allowing them to temporarily continue buying Iranian oil, U.S. Secretary of State Mike Pompeo announced. China, India, Japan, South Korea, Italy, Greece and Taiwan were also exempted from the sanctions. This group of eight buyers imported over 80 percent of Iran's roughly 2.6 million barrels per day (bpd) of oil exports last year, according to consultancy Refiniv Eikon's data. As a result of pre-sanctions pressure from Washington, Iran's oil exports in November may not exceed 1 million to 1.5 million bpd, according to industry estimates. Companies that monitor Iran's shipments are already seeing a drop in tanker activity this month. Each of the countries, key buyers of the third-largest exporter of the Organization of Petroleum Exporting Countries (OPEC), have cut down their purchases from Iran over the last six months. Japan and South Korea were previously reported to have fully ceased oil purchases from Iran.